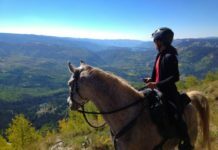 Part of the hoof care provider's job, no matter what your area of focus, is to have resources available to you to solve problems for your clients and their horses. As a farrier who focuses on rehabilitation of the equine foot, I'm always in search of new tools to help the horses I work on. In the case of this horse, I was excited to have the new EasyShoe as a tool to help him. 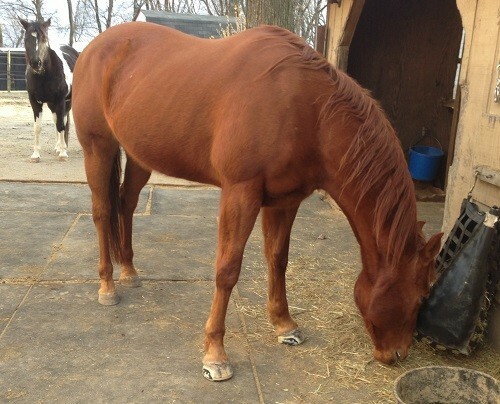 He came to me this past fall, an older quarter horse gelding, and had been having steady lameness issues for years. 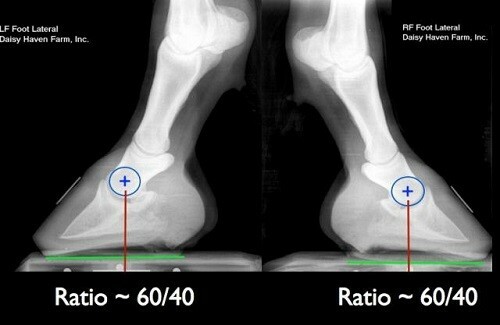 From the farrier perspective there is a lot of room for improvement in these X-rays. 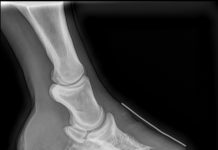 I have explained my goals for trimming and shoeing from radiographs in various scenarios in these previous blogs: What To Do With That Foot?, For The Love of the Small (Often Foundered) Pony, Rehabilitation of the Insulin Resistant Foundered Horse: DHF Style and Broken Down May Not Be So Broken. 3-8 degree palmar P3 angle: the angle of the bottom of the coffin bone in relation to the ground. 50/50 base of support from toe to heel around the center of rotation of the hoof capsule. 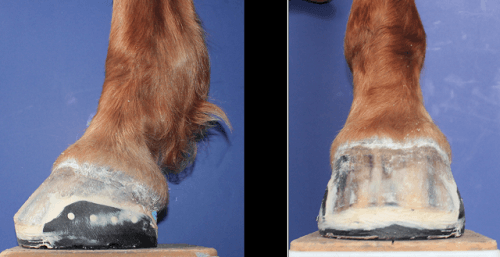 Minimizing flare and distortion in the hoof capsule. 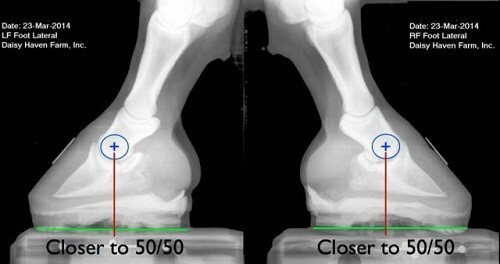 The two biggest areas for improvement for this horse in 2012, were the long toe (base of support longer in the toe than heel) and the flare at the toe indicating distortion in the hoof capsule. 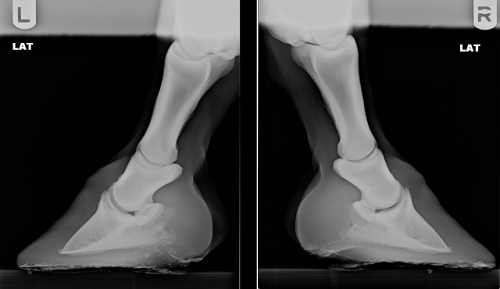 There were many diagnoses regarding why this horse was chronically foot sore: from navicular to founder. 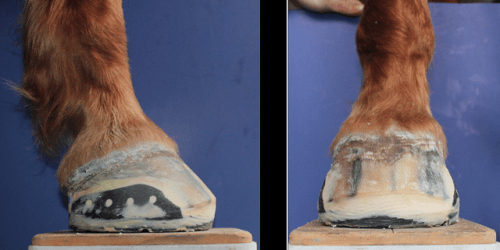 However, despite many different treatment options being implemented over time, the biggest improvement to the hoof was when the horse was taken barefoot and the hoof capsule was rehabilitated to the above parameters by a fellow hoof care provider. I became involved in October 2013. 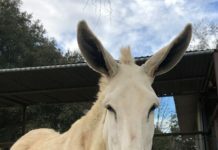 The hoof care provider had done a very good job with rehabilitating the horse's feet, and while he was much sounder than any previous approach to helping his feet, he still had periods of unsoundness that needed to be addressed. 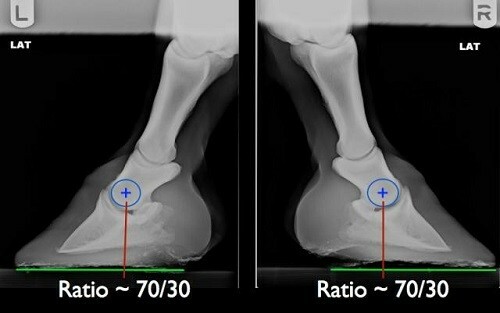 When I assessed the horse it was apparent to me that while the distortion was gone, and the hoof capsule was much more compact, the hoof care provider was never going to be able to get these feet to a 50/50 balance around the center of rotation of the hoof capsule. The toe could not be trimmed any shorter, and while lowering the heels more would increase the heel portion of the support, the palmar P3 angle would start getting too low. So I didn't feel that was a viable solution. We decided to create the mechanics we needed with the EasyShoe. We were able to set the shoe just a bit further back, and provide additional heel support, which brought our entire foot print back. We were also providing foot protection and concussion dampening with the plastic and glue, which I felt would provide additional benefit. The horse is quite sound and ready to go home and get back to enjoying riding with his owner. I believe the addition of the EasyShoe was the final piece of the puzzle to helping this horse overcome his chronic lameness issues.